Summer is just about here, as Memorial Day Weekend marks the unofficial start to summer, although summer doesn’t officially kick off until June 21st. Guests can splash into summer a week early at Water Country USA as the park will be kicking off it’s 2014 season tomorrow, May 17th. Get your bathing suit and sunscreen ready for tomorrow and head out to Water Country USA. The park is must-do this summer with the addition of a brand new and quite unique water slide, Colossal Curl. Colossal Curl is scheduled to open just in time for Memorial Day Weekend on May 23rd. 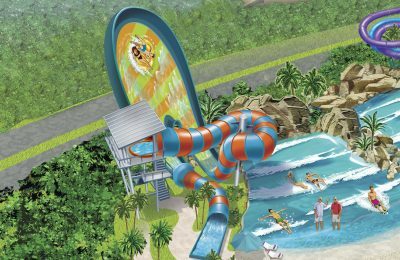 On an even more exciting note, Water Country USA has announced that guests who visit this weekend, they will be able to get a chance to preview Colossal Curl during a soft opening period before the attraction officially opens to the public next weekend. If you’re looking for a chance to ride Colossal Curl and saving a little bit of time in line, this weekend will be the perfect opportunity to ride! Busch Gardens is just a short drive from Water Country USA, so to make the most of summer, Water Country USA and Busch Gardens Williamsburg are offering a sweet deal on a 2-park Fun Card. The 2-park Fun Card includes unlimited admission to Water Country USA and unlimited admission to Busch Gardens Williamsburg through September 1st. The 2-park Fun Card is priced at just $97, making it a very affordable option to a summer full of thrills, chills, and amazing attractions that both parks have to offer – like Colossal Curl at Water County USA and London Rocks at Busch Gardens Williamsburg. Water Country USA will be opening at 10am tomorrow morning for the 2014 season. Daily operation at Water Country USA will begin on May 23rd. For more information about Water Country USA, visit the official website by clicking here.